Not long ago, I put together a project, housed in a plastic RadioShack box, which contained a component that could get hot enough to self-destruct in a closed box. I added a small cooling fan to the box, but the noise was excessive. I decided that I could minimize the noise if I only ran the fan at the speed necessary to cool the components. I considered just slowing the fan to some speed that produced less noise. The problem with just running the fan slower is that the cooling may be inadequate. A rise in ambient temperature or higher power dissipation in the circuit would cause everything to overheat. So, I decided to adjust the fan speed with temperature, running at minimum speed when the circuit is cool and increasing fan speed as the temperature increased. I measured the temperature of the hot component with a thermistor and adjusted the fan speed based on that temperature. A schematic of the circuit is shown in Figure 1. FIGURE 1. Schematic of the fan controller circuit. T1 is a thermistor mounted to the component needing to be cooled. The circuit uses a single quad op-amp, U1, an LM324. Q1 is a PNP power transistor that supplies current to the motor. T1 is a thermistor that provides temperature sensing, and is mounted to the component that needs to be cooled. Small DC fans are typically one of the less reliable components in an electronic system, so the circuit includes a fault output to indicate when the temperature rises beyond acceptable limits (in this case, a bit less than 70°C). This could happen if the fan fails or if the ventilation holes become plugged with dust or covered with a piece of paper. The fault output can notify a processor to shut off power or take some action to reduce power dissipation in the circuit. The fan I used will operate from 5V to 12V. At 5V, the noise is almost inaudible, so the circuit always supplies 5V to the fan, through U1B. As the temperature rises so that the output needs to rise above 5V, U1A begins to sink current, raising the fan supply voltage. Operating the fan in this way provides two advantages: First, there is always some airflow through the box. Second, it simplifies the circuit since there is no need to add circuitry to turn off the output when it would be below the minimum fan operating voltage. In an op-amp that is linear (the output is not saturated at either supply rail), the inputs (U1-3 and U1-2, in this case) will be at the same voltage. The voltage at U1-2 is controlled by the voltage divider comprised of T1 and R1 and varies with temperature. The voltage at U1-2 is controlled by the voltage divider comprised of R3 and R2, and varies with fan voltage. The thermistor can be used to measure air temperature inside the enclosure, but you typically want to measure the temperature of an IC, heatsink, or other component. In this case, I used a small bead-type thermistor, glued into the barrel of a ring terminal (Figure 2). FIGURE 2. The thermistor for this project was a bead-type thermistor glued into the barrel of a ring terminal. Conductive epoxy is the best way to do this. You can also get thermistors already attached to tabs, drilled for mounting. The ring terminal was then attached to the hot component with a machine screw and nut. This would work with a component such as a hard drive, or a part with a heatsink. If the part is, say, a TO-220 transistor, you could attach the thermistor with the same screw that attaches the transistor to its heatsink. If you are measuring the temperature of an IC, you would want to glue the thermistor to the IC package or to a heatsink that is then glued to the package. Thermally conductive epoxies for mounting thermistors are available from companies such as Omega (www.omega.com). Various manufacturers, including RTI Electronics (www.rtie.com) and Vishay (www.vishay.com) make thermistors already mounted to metal tabs with mounting holes. Although maintaining a fixed temperature would seem more “normal” for a control system, in this case, it would result in higher fan noise. At higher ambient temperatures, or under increased load, a constant-temperature circuit would run the fan faster to maintain the temperature. By allowing the temperature to float up with ambient temperature and circuit power dissipation, the average fan speed will be lower (although the temperature will usually be higher than a fixed setpoint would be). So, what happens if the fan runs at full speed all the time and the temperature is still above the upper limit? That means the fan is too small to start with, or that the ventilation is either inadequate or blocked. In that case, it doesn’t matter if the circuit is a constant-temperature controller or not — no type of fan control can provide adequate cooling. The resistance of an NTC thermistor does not have a straight-line relationship with temperature; instead the curve is approximately logarithmic (Figure 3). FIGURE 3. 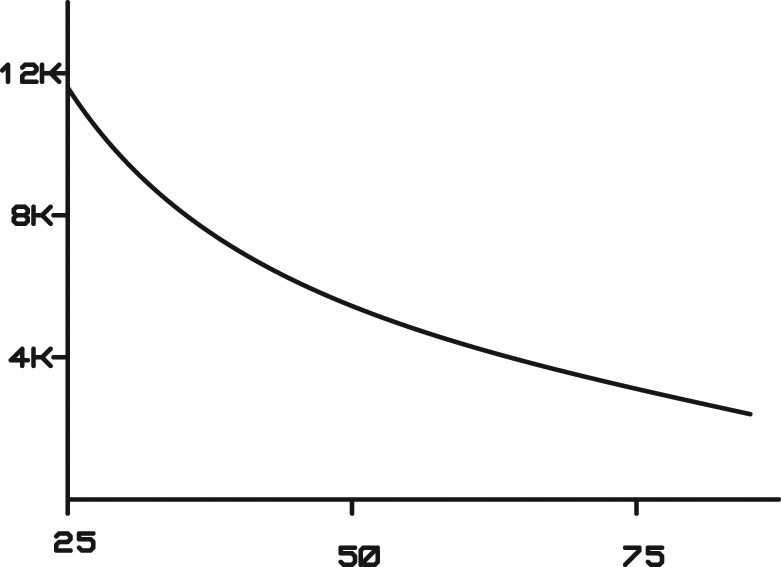 The thermistor has an approximately logarithmic temperature-resistance curve. This means that the fan speed will increase faster near lower temperatures, and increase more slowly as the temperature approaches maximum. 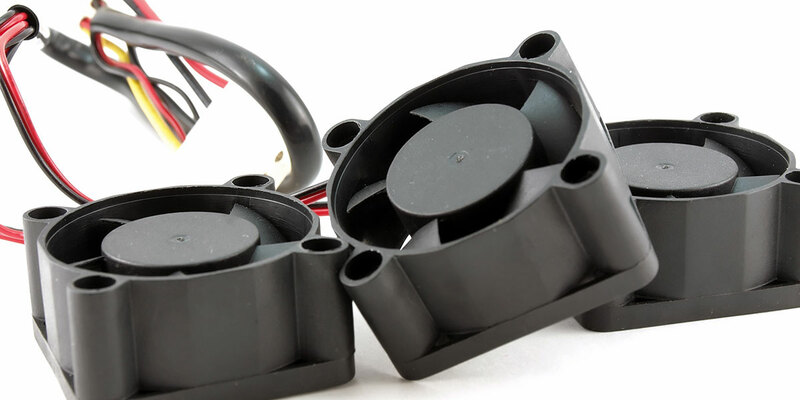 Since the fan supply voltage varies with thermistor resistance, the fan supply voltage will increase faster around 5V, and slower as it approaches 12V. Another approach to this project would be to control fan speed directly (instead of controlling fan voltage) using a fan with a tach output. These fans produce a pulse once or more per revolution. Of course, this approach requires some method of translating the tach signal to a control voltage — typically with a microcontroller or fan controller IC. PWM (pulse width modulation) could also be used to control the fan, and would eliminate any problems with power dissipation in Q1. However, this requires a fan that is capable of PWM operation — many low-voltage DC fans use brushless DC motors with internal controller ICs that don’t respond well to PWM control. Although the fan used here is a low-current device, if you were operating from batteries, you might want to turn the fan completely off if the temperature is low enough. The simplest way to do this is to add a microcontroller (covered next). You could also add circuitry to inhibit the fan output completely below 5V. 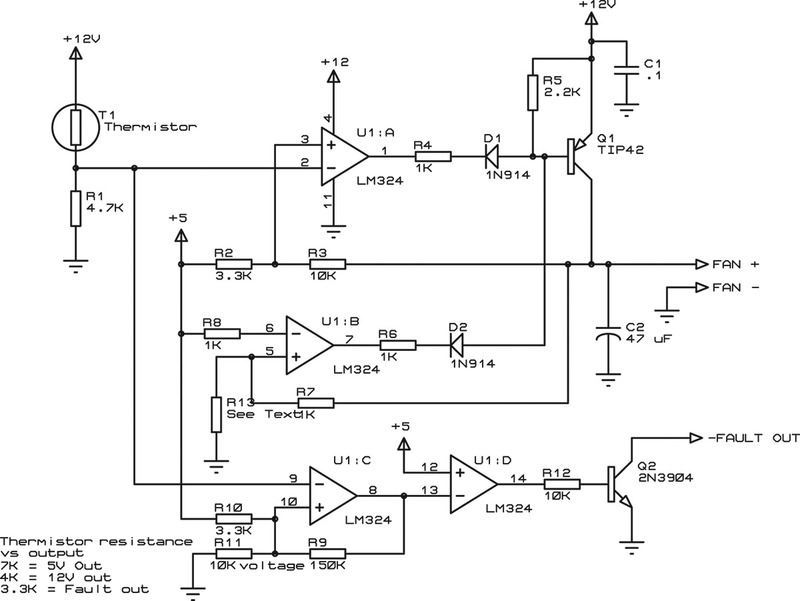 By now, some readers are asking why not just use a microcontroller for this circuit? There are a number of controllers with on-chip ADCs to read the thermistor, and adjusting the temperature setpoints is a simple matter of changing the firmware. A microcontroller-based design would work, but many of the parts in this circuit would still be needed: the thermistor voltage divider, the output transistor, and an op-amp to drive it. In addition, the microcontroller would require a DAC unless one was available on-chip. A microcontroller solution would potentially increase EMI (not a consideration in my one-of-a-kind project, but certainly a consideration on a production design). A microcontroller is already used elsewhere, so added cost is minimal. PWM motor control is needed. The temperature-fan speed curve needs to be “linearized” to compensate for the logarithmic thermistor curve. Setpoint adjustment needs to be customized to the application, or environment. Constant temperature control is needed. You want to turn the fan completely off below a particular temperature for lower current drain (as in a battery application). As already mentioned, the circuit uses 5% resistors, but 1% values would produce better accuracy. The 12V and 5V references could be replaced with precision 2.5V or 5V references. However, doing so means that the equations must be reworked with the thermistor you plan to use. It is possible to pick values that cannot be “mapped” to the output voltages you want. This will be obvious when you do the math (see “Working the Equations”) because you will end up with a negative value for one or more resistors. Finally, the thermistor tolerance affects precision. Thermistors typically have a 5% tolerance, but 1% or better parts are available. You could also characterize the thermistor you plan to use, but if you need that level of precision, you probably need to do some sophisticated airflow analysis. Solving this with the quadratic equation results in R2 = 4.95K (the other root is negative). Inserting that back into either equation for R1 yields R1 = 6.25K. Substituting a different thermistor or different temperatures just means you have to substitute the resistance values for the thermistor/temperature you want to use. For example, if your thermistor has a resistance of 8K at the lowest fan temperature, you would substitute 8K for 7K in the equation for 5V operation (or 7V operation, in the above example). The same thing could be accomplished by leaving out R13 and connecting a voltage divider from 12V to ground, using values that produce 7V at the junction of the two resistors. 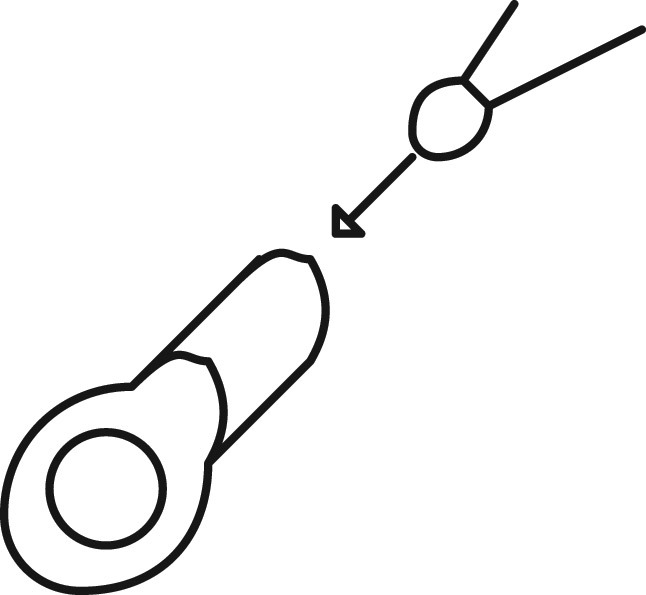 U1-6 would connect to the 7V junction point.